What is the Planning & Development Department? This department was previously known as the “Growth Management Department”. The Town reintroduced the department as the Planning & Development Department in 2017. The name was changed to better reflect the Department’s emphasis on comprehensive planning, economic development and addressing the Cape’s housing challenges. The Planning & Development Department is comprised of four programs: Comprehensive Planning, Regulatory Planning, Community Development, and Economic Development. The divisions work together, and with community partners and other Town departments, to promote comprehensive, sustainable land use and economic development strategies to preserve the character of the Barnstable’s seven villages and improve residents’ quality of life. -Coordinates capital improvements towards that overall vision. What is Economic Development’s role within the Planning & Development Department? The Economic Development program provides professional staff support to implement the Town’s economic development plan. Specific activities include promoting Hyannis’ revitalization, collaboration with the Hyannis Area and Cape Cod Chambers of Commerce, the Downtown Hyannis Business Improvement District, planning and study initiatives for Route 132 Regional Commercial area and corridor, Hyannis Harbor and Route 28 corridor. Business Outreach: Through this initiative we learn about the Barnstable business climate and share the Town’s goals and planning initiatives. Most importantly we engage in open and honest discussion about how Barnstable fares at being “Open for Business”. This cornerstone communication strategy is a top priority. What are the 7 villages of the Town of Barnstable? Do I need a Business Certificate? Where do I obtain one? Any individual, partnership or corporation doing business under a name, other than their own name or incorporated name, must file a business certificate. The certificate costs $40 and is good for 4 years. You need to come in to the Town Offices at 200 Main St, Hyannis and submit a zoning review form for signoff by the Building Commissioner. This form is then submitted to the Town Clerk’s Office for processing. Is there any business start-up assistance available for Veterans? How do I obtain a tax ID # for my business? To set up a federal tax ID number (also called an Employer Identification Number, or EIN), contact your nearest Local IRS Field Office, or call the IRS Business and Specialty Tax Hotline at 800-829-4933. You can also apply online for an EIN via the IRS web site. The online application asks the questions, you provide the answers and, just like that, you get your EIN immediately. You can then download, save, and print your EIN confirmation notice. If you want to apply the old-fashioned way, the form you'll need to fill out is IRS From SS-4 (.pdf). How can I find available commercial properties for sale or lease? The local commercial real estate brokers each maintain a listing of available properties for sale or lease. What do I need to do when I close a business in Barnstable? Which services are located at 200 Main St in Hyannis? Regulatory Review provides professional planning support, technical assistance and clerical services to the Planning Board, Zoning Board of Appeals, Old King’s Highway Historic District Committee, and Hyannis Main Street Waterfront Historic District Commission and Appeals Committee. The function provides general advice and assistance on day-to-day zoning, planning and historic issues to Town residents, businesses, and other Town entities. Regulatory Review also provides technical assistance and clerical services for Site Plan Review. Where do I access Building Permit information & applications? Where can I see zoning maps? What is the procedure for obtaining a sign permit in the Hyannis Main St Historic District? What are the requirements for obtaining a sign permit in any other area of Town? What are the Building Permit Fees? What is the process for Site Plan Review? Site Plan Review is an administrative process established to advise the Building commissioner. The objective of Site Plan Review is to assure development standards are met in all business, commercial, industrial, and multifamily projects. Site Plan Review is composed of representatives from these Town Departments: Health, Building, Conservation, Planning & Development, and Engineering. Also included are the fire districts and water and utility purveyors. Where can I access the Town Ordinances and Regulations? Where can I get information about Liquor Licenses? Licensing Authority is responsible for balancing the needs of the community with the needs of license applicants. The Licensing Authority holds regular public meetings to hear requests for new and amended licenses and considers impact on neighborhoods, public safety, public order, and compliance with state and local regulations in their decision process. How do I obtain permission for a sidewalk café in Downtown Hyannis? Licensing Authority and the Town Manager are responsible for approval of applications for outdoor dining in Hyannis. What is Hyannis Main Street Waterfront Historic District? The Hyannis Main Street Waterfront Historic District(HHDC) was created in 1996 as part of the ongoing efforts to address revitalization and historic preservation in downtown Hyannis. The HHDC promotes the preservation of the unique historic character of downtown Hyannis and Hyannis Inner Harbor. The Commission strives to create a desirable place to live, work and enjoy through the preservation, maintenance and improvement of historic vernacular. What is the Growth Incentive Zone(GIZ) in Hyannis? The designation of a Growth Incentive Zone(GIZ) in downtown Hyannis is a streamlined regulatory approach to allow local control by raising Cape Cod Commission Development Regional Impact thresholds. The GIZ allows the Town to direct opportunity to the center of the Village of Hyannis by supporting village-scale density and mixed use zoning furthering a town-wide plan to create a healthy community and a sustainable economy. What types of local incentive programs are available to new or expanding businesses? -Stimulate capital investment and creation of jobs paying above the area median income for Barnstable. Provide substantive increases in employment with salaries higher than the area median income. Provide private capital investment resulting in a substantive increase in net taxable property value. -Foster reconstruction and renovation of vacant or underutilized commercial properties. What type of loans does the SBA offer? The Microloan Program provides small, short-term loans to small business concerns and certain types of not-for-profit child-care centers. The SBA makes funds available to specially designated intermediary lenders, which are nonprofit community-based organizations with experience in lending as well as management and technical assistance. These intermediaries make loans to eligible borrowers. The maximum loan amount is $50,000, but the average microloan is about $13,000. What is the CDC/504 Program? The CDC/504 loan program is a long-term financing tool, designed to encourage economic development within a community. The 504 Program accomplishes this by providing small businesses with long-term, fixed-rate financing to acquire major fixed assets for expansion or modernization. A Certified Development Company (CDC) is a private, nonprofit corporation which is set up to contribute to economic development within its community. CDCs work with SBA and private sector lenders to provide financing to small businesses, which accomplishes the goal of community economic development. The Town of Barnstable is part of the Barnstable County Regional Economic Target Area which allows Barnstable to use local and state tax incentives to attract new business, expand existing businesses, and stimulate job creation and business investment. - Stimulate capital investment and creation of jobs paying above the area median income for Barnstable. Provide substantive increases in employment with salaries higher than the area median income. Provide private capital investment resulting in a substantive increase in net taxable property value. - Foster reconstruction and renovation of vacant or underutilized commercial properties. What is the HyArts District? The HyArts District in downtown Hyannis is home to local artists with seaside shanties, year round artist studios and galleries, free events all year including theater and musical performances alongside Hyannis Harbor, art walks, open studios, art festivals and much more. These initiatives are key components to the success of the revitalization of downtown Hyannis and has stimulated collateral private development on Pearl and North Streets. It has become a live/work/play area for residents and a true destination for visitors. What are the area Chambers of Commerce? What is the Hyannis Main St Business Improvement District (B.I.D.)? 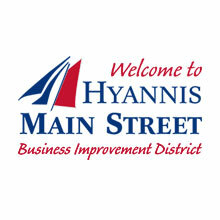 The Hyannis Main Street Business Improvement District (HMSBID) is a private nonprofit organization that was established in 1999 in response to the need to carry out the revitalization of downtown Hyannis. Business Improvement Districts (BID) across the country have been successful in revitalizing downtowns because they are funded by the property owners within the district who provide a dependable revenue stream. The HMSBID is a special assessment district, enabled by Mass. General Laws Chapter 40 (0) and sanctioned by the local legislative body; fees are binding. What are the various Economic Development boards and committees in the area? Where can I obtain demographic information about Barnstable? Cape Cod? What other business resources are available? How can I bid on Town of Barnstable contracts for goods & services? On the link above you will find all the Invitations for Bid and Requests for Proposal (RFP) for the Town of Barnstable that are currently available to the public.